John Stair was only a day or so into his pleasure trip to Costa Rica when paradise was almost lost at the end of an “endless” swimming pool. 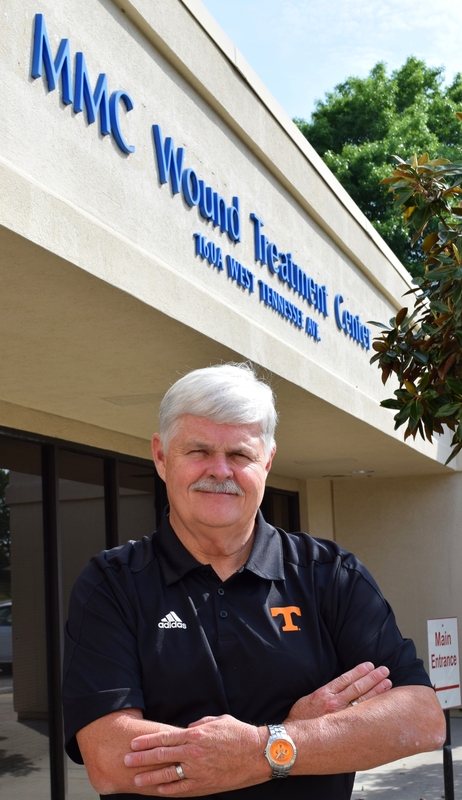 It was there that Stair scraped his right foot against the rough finish surface of the pool, peeling back the skin and setting the stage for a nasty diabetic wound that required the special healing skills of Methodist Medical Center’s Wound Treatment Center in Oak Ridge. “I can’t say enough about how good the care was at The Wound Treatment Center,” said Stair, a 65-year-old retiree who had been diagnosed as “borderline diabetic” three years earlier, but had only begun taking medication to control his blood sugar weeks before leaving for his tropical excursion. But the cast does more than keep pressure off the wound – it also provides a healing environment. Before it is applied, the wound is cleaned and coated with an antibacterial topical wound dressing and wrapped in absorptive cover dressings. It is rechecked within three days and then weekly until healed. Lessons learned from his misadventure in paradise have changed Stair’s perspective on his diabetes. Even before John Stair was diagnosed with diabetes, he was contending with an inherited form of neuropathy or nerve damage that causes a loss of sensation in the feet. Poor circulation and elevated blood sugar levels makes it harder for patients to fight infection. As a result, healing even minor wounds can take weeks or even months. In fact, 25 to 30 percent of patients with diabetes develop foot sores, or ulcers, mostly on the ball of the foot or along the bottom of the big toe. About 84 percent of all lower leg amputations are preceded by diabetic foot ulcers, but the risk of amputation can be reduced by 85 percent with early intervention and proper treatment. That loss of sensitivity is one reason patients with diabetes are strongly encouraged to see a podiatrist at least yearly. Not only can the podiatrist safely remove callus tissue, but can watch for changes such as charcot foot, a serious condition in which the bones can weaken enough to fracture and with continued walking, lead to severe deformity, disability and even amputation. Special diabetic shoes can help prevent that from occurring. Some wounds, however, require hyperbaric treatment.